We’ll make sure you enjoy the internet’s lowest rates when you purchase your 1878-1904 Morgan Silver Dollar NGC MS-64 silver coin from our online store today. The Morgan Silver Dollar has held its position as one of America’s most collectible coin’s, thanks to its faultless, beautiful design, as well as its notable position in U.S. coinage history. The reverse of this treasure features a striking display of an American bald eagle with open wings, clutching an olive branch and arrows, above a stylized laurel wreath. You’ll also find the American Motto, ‘In God we trust’ on the reverse, along with the U.S. legend and the coin’s unique face value, all encapsulated in a light, dotted border. The obverse feature is George Morgan’s Lady Liberty, fashioned after sitter, Anna Willess Williams and wearing a Phrygian cap adorned with the word, ‘Liberty,’cotton stalks and wheat ears. Also on the reverse, 13 stars, the American motto, ‘E pluribus unum’ and the coin’s year of issue. These particular Morgan Silver Dollars have been awarded an MS-64 rating on the NGC grading scale, Putting them above most of the available MSDs in condition and appearance. Own this sought-after collectible and diversify your portfolio with a 1878-1904 Morgan Silver Dollar NGC MS-64 silver coin today! Reverso Bald eagle with wings spread clutching an olive branch and several arrows and the words "United States of America In God We Trust One Dollar"
1878-1904 Morgan Silver Dollar NGC MS-64 Silver Coin We’ll make sure you enjoy the internet’s lowest rates when you purchase your 1878-1904 Morgan Silver Dollar NGC MS-64 silver coin from our online store today. The Morgan Silver Dollar has held its position as one of America’s most collectible coin’s, thanks to its faultless, beautiful design, as well as its notable position in U.S. coinage history. The reverse of this treasure features a striking display of an American bald eagle with open wings, clutching an olive branch and arrows, above a stylized laurel wreath. You’ll also find the American Motto, ‘In God we trust’ on the reverse, along with the U.S. legend and the coin’s unique face value, all encapsulated in a light, dotted border. The obverse feature is George Morgan’s Lady Liberty, fashioned after sitter, Anna Willess Williams and wearing a Phrygian cap adorned with the word, ‘Liberty,’cotton stalks and wheat ears. Also on the reverse, 13 stars, the American motto, ‘E pluribus unum’ and the coin’s year of issue. 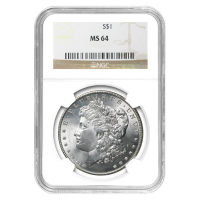 These particular Morgan Silver Dollars have been awarded an MS-64 rating on the NGC grading scale, Putting them above most of the available MSDs in condition and appearance. Own this sought-after collectible and diversify your portfolio with a 1878-1904 Morgan Silver Dollar NGC MS-64 silver coin today!